I love my couch. I sit on it all the time, reclined against a pile of pillows that are arranged just so, legs up and outstretched, afghan over me, coffee table next to me with dinner dishes stacked waiting for a trip out to the kitchen. Discarded earrings litter the coffee table, along with Sunday’s newspaper, and a book flopped open.I bought the couch probably 15 years ago–I don’t remember exactly when it became part of my living room decor. 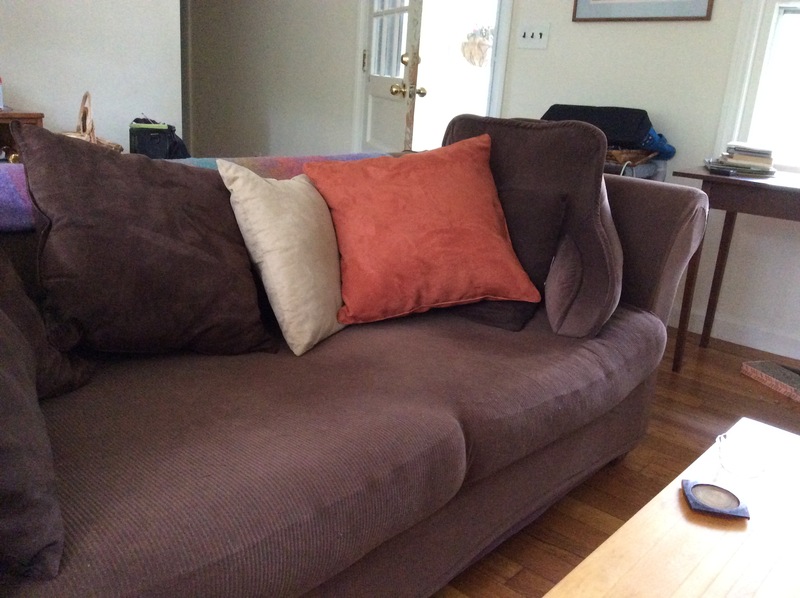 It’s upholstered in a brown cotton fabric. Bauhaus style the label said–it has high arms (perfect for piling those pillows up), and soft cushions, a distinctive line to the back and flare of the arms. Newly purchased it was elegant–the most expensive piece of furniture I’d ever bought–I who was queen of the Goodwill and second hand furniture stores, whose good pieces of furniture were mostly things brought from my parent’s house. Elegance soon faded along with the fabric which got sun bleached along the back and tops of the arms. And my 3 cats decided that the arms made great scratching posts. I taped foil to the arms, then sticky strips guaranteed to deter kitty claws, sprayed it with noxious smelling sprays which kept me away but not the cats. The fabric quickly succumbed to the kitty attention and shred marks adorned the front of the arms. I bought the first in a series of ready-made slipcovers, something green and synthetic and floppy. Then at some point I discovered the stretchy slipcovers that now cover it up–what one friend calls an undershirt for furniture. It’s corduroy textured, fitted, and seemingly indestructible even with a determined cat. But to get this cover to fit, I had to remove the back cushions (and it’s hard to sit sideways as I love to do with those cushions there). I now have an array of throw pillows lining the back. When I have company, I arrange them just so but I think they’re really not all that comfortable. As soon as the company leaves, the pillows get piled at the end or tossed aside and my nest re-emerges. This year I announced to a friend that i was finally going to replace the couch. But I haven’t done it. Yellow chair just after I moved into my house. This all reminds me of the faded yellow armchair that I brought home from my mother’s house after she died. I hadn’t yet bought a house–didn’t even know I was going to do so–but house or apartment, the chair would be a comforting reminder of my childhood home. Mom and dad had bought the chair shortly after they were married and it followed them from home to home, taking pride of place in the living room for many years, upholstered, reupholstered, slipcovered, and finally reupholstered yet again, its final coat a tough pale yellow fabric that was scratchy against bare skin. At some point it left the living room and was relegated to the small back bedroom that my mother used as her nest. I did eventually buy a house and placed the chair in the living room, near the fireplace. But somehow it never looked at home. It was somehow out of proportion to my other furniture, too old fashioned, and ultimately too worn. There were those cats–the tough fabric of the upholstery stood up to their claws for quite a while but then gashes began to show through. And there was a kind of musty smell to the chair. I’d drape it with throws or try to dress it up with ready-made slipcovers but it never really fit. Eventually I had it hauled away along with a truckload of items destined for the dump. I remember the pickup truck pulling out of the driveway with the chair perched on top of the load. I felt sad, felt I was betraying that chair, guilty that I hadn’t taken better care of this relic from my family’s past. I have other things that I brought from Ohio and take care of and cherish–a lamp, a painting, a glass vase, a pottery vase, some small wood carvings. I value these items for their own beauty as well as the association with mom and dad. But this poor sad chair got discarded. Of course, my mother would probably have nagged me to get rid of the chair long before I did. And she’d be telling me that the couch needs to follow. This entry was posted in Family, House by LB. Bookmark the permalink.